Better late than never as Brazil finally looks to develop solar power on a larger scale, with near-perfect conditions and a potential energy crisis in its hydroelectric sector due to drought. Brazil has taken its first steps towards large-scale deployment of solar power, following a government auction of energy generation rights. The government has awarded contracts for the construction of 31 solar parks across the country, which together are expected to generate around 1,048MW of clean, renewable and cheap electricity. The sun-soaked South American giant is considered to have some of the best conditions for solar power in the world, but up to now it has been pitifully slow at mirroring the efforts of fellow emerging economies such as China and India, or Latin American neighbours such as Chile or Mexico, in developing national solar power sectors. The auction, held on October 31st and in which the Brazilian government set a maximum price for Megawatt-hours (MWh) before energy companies bid down the price at which they are willing to sell their energy, saw the price of solar set at US$89 per MWh, around 20% lower than the initial price, according to Reuters. This was the first time that a set amount of solar power capacity was set aside in the auction, with 500MW worth in contracts guaranteed. The auction saw close to 2GW worth of renewable energy awarded in contracts, with the majority snapped up by wind power, a sector that has been able to compete with the more established forms of energy generation (such as fossil fuels and hydroelectricity) for some time now. The solar parks, which will be the first large-scale solar farms in the country, will be run under 20-year energy supply contracts, will require investments of around US$1.7 billion, and will hopefully be ready to start providing electricity to the national grid in 2017. Brazil’s state development bank, BNDES, was expected to provide as much as 80% of the investment required. 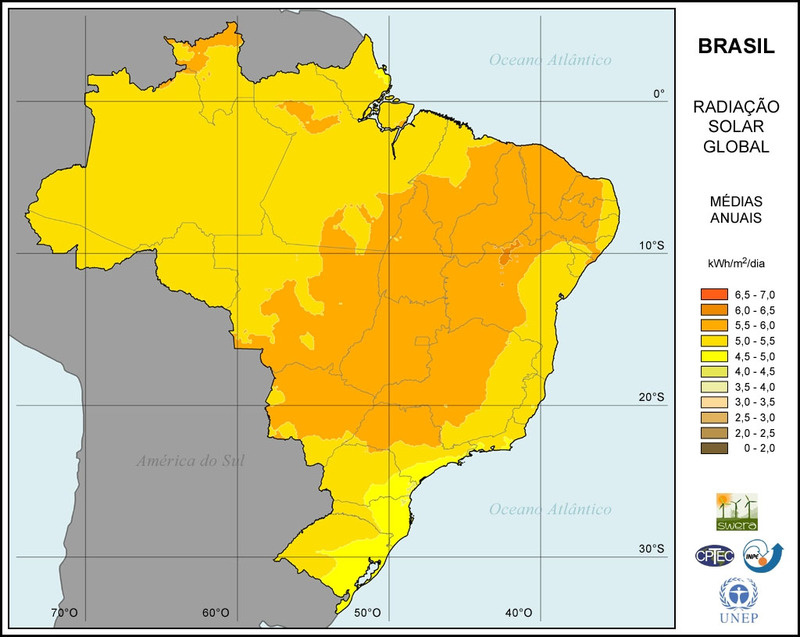 A solar radiation map, showing the potential for solar power generation across Brazil, generally between 5 and 6 kWh per square metre per day. Image courtesy of SolarPACES via Rios Vivos. The auction was praised as a milestone in the development of Brazil’s solar power sector, with Mauricio Tolmasquim, head of the Empresa de Pesquisa Energética (EPE – Energy Research Company), stating: “this auction is a mark, not only because it signals the entrance of solar power in the Brazilian energy mix, but because it was one of the most competitive to date”. He added that the US$89/MWh rate was one of the lowest in the world for solar power. This competitive rate was helped by both Brazil’s high levels of solar radiation – which would guarantee high productivity for energy producers – and by the fact that many of the new solar parks would be built on land that was already home to wind farms, thus reducing costs from aspects such as land price and the construction of additional transmission lines. The amount awarded in the auction far surpassed prior expectations of around 500MW in solar capacity, and dwarfs the 30MW in solar power that is currently generated across all of Brazil. It is hoped that by 2018, Brazil will have been able to add a total of 3.5GW in solar capacity. However, even this would pale in comparison to the amount expected to be installed in countries such as Chile and Mexico, or indeed China which is expected to add 14GW this year alone. It would also represent just a fraction of Brazil’s current installed capacity, which in 2012 stood at 112GW. 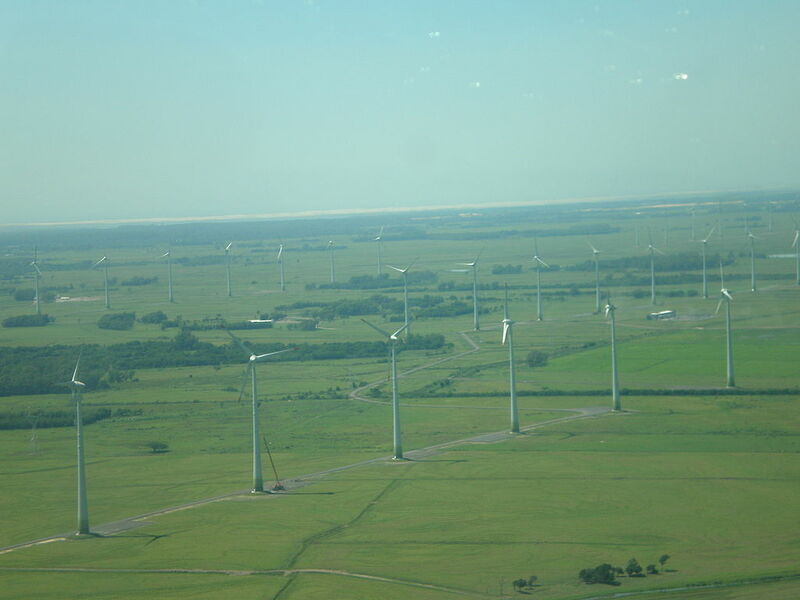 A wind farm in Rio Grande do Sul, southern Brazil. While solar power has been slow to take off in Brazil, wind farms already make a modest contribution towards national electricity production. Photo courtesy of Solar Thermal Magazine. There are several reasons why Brazil has lagged behind other countries in developing solar power, in spite of favourable conditions including solar radiation that is, on average, twice as strong as in Germany, one of the world leaders in solar power generation. One of these reasons is the failure of the government to guarantee solar producers a slice of the energy contracts cake served up at auctions, given the ability of providers generating electricity from cheaper sources – such as fossil fuels, hydroelectricity, or wind power – to bid lower than them. Another key reason cited by experts is that import tariffs imposed by the Brazilian government make solar power comparatively more expensive than in other countries. Brazil doesn’t currently manufacture solar panels domestically, and imports are taxed at 12%, according to Bloomberg. However, the need for concerted action to encourage growth in the solar power sector has perhaps never been greater. One of the most severe droughts ever recorded in Brazil is gripping the south-east of the country, with the country’s economic powerhouse and most populous state, São Paulo, particularly badly hit. As well as unleashing water shortages that have left millions vulnerable, the record-low water levels are also affecting hydroelectric capacity. This represents nothing less than a national crisis, as Brazil gets around three quarters of its electricity from this source. A major drought in 2001 caused regular blackouts across the country as hydroelectric reservoirs dried out, and a repeat has only been avoided thus far due to the emergency use of fossil fuel-fired power plants. With climate change expected to prompt further climatic extremes in the future, the threat of increased and more intense droughts means that Brazil desperately needs to diversify its energy mix, while continuing to play its part in global efforts to bring down carbon emissions. This is particularly important in a country such as Brazil, where a rapidly expanding middle class is driving the increase in demand for energy even more. The dried out Atibainha Dam in Brazil. 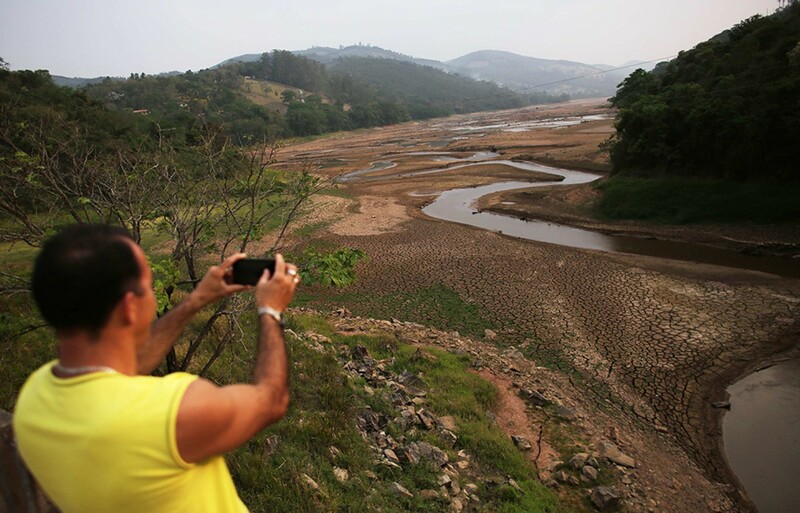 A severe drought is causing water shortages, with hydroelectric capacity – on which Brazil is overwhelmingly dependent for its energy – badly hit. The drought and its knock-on effect on energy availability has highlighted the need for Brazil to diversify its energy mix to more sustainable and reliable renewable sources. Photo courtesy of Nacho Doce / Reuters.